The PCL341 series has been discontinued. Please see the DPG4000-KIT in combination with PCL1000.html as comprehensive calibration solution or contact our Pressure Engineering department. 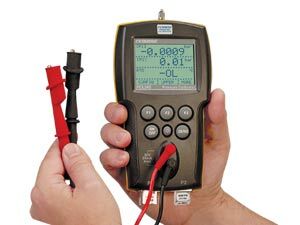 참고: Pressure calibrators come with soft case, batteries, manual, NIST-traceable certificate and test leads. Pressure calibrator kits include calibrator, RTD Pt100 probe, batteries, operator's manual, NIST-traceable certificate, test leads and hard-sided carrying case. Gage, absolute and compound types are isolated and accept any media compatible with 316 SS. Vacuum and differential types are compatible with pressure media that are clean, dry, non-corrosive air or gas. For full listing of external pressure modules available see link below.